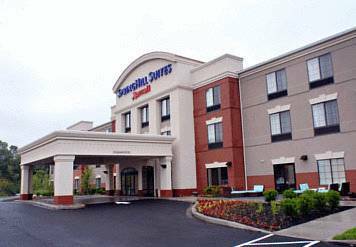 The SpringHill Suites by Marriott Quakertown, provides our guests ample space to efficiently get things done on-the-go, or to simply relax while unwinding in comfort. Our contemporary design of the spacious suites makes them 25% larger than a comparably priced hotel room, giving you room to succeed not only at work, but in play. Whether traveling with the Family to Dorney Park & Wildwater Kingdom, or visiting local businesses such as Draeger, Knoll or Pulse Technologies, we are the perfect location for your base of operations offering decor and amenities to ensure that every detail of your busy schedule is not overlooked. Our goal is for you to awaken each day confidently, feeling renewed with fresh inspiration. Bring the Family and enjoy the scenic beauty of Upper Bucks County or nearby attractions like The Quakertown Farmer's Market, the Crayola Crayon Factory or Peddler's Village. Come experience us for your every stay! Not only a historic gallows, but hundreds of bizarre artifacts -- such as a vampire-killing kit -- exhibited in a castle made of concrete. Historic boneyard with oddball and ostentatious monuments, and themed tongue-in-cheek tours. Gift shop with funky souvenirs. Waves of schoolkids still conduct daily heart attacks on the Giant Heart at the Franklin Institute.